Douaa remembers her life as a refugee in Lebanon. She was working in a grocery store to help support her family, her dream of going to university put on hold. Now, less than three years later, Douaa is a first-year student at Carleton University pursuing a degree in political science. Her adventure started in 2014 when Douaa and her family fled their home in Syria in order to escape the brutal civil war. Their lives were at risk and there was no other option other than to escape. “I left Syria for Lebanon in 2014 with my parents and three brothers because my brothers were going to be forced to join the army,” she remembers. Other young men had been forced to join the Syrian army, so it was a real fear. The family arrived in Lebanon in January of 2014 and quickly connected with relatives who had fled earlier. But they knew within a few days that life in Lebanon was going to be extremely difficult and was not a long-term option. Douaa knew they had to do something. Lebanon was not a safe place for Syrian refugees. It was a challenge for the Lebanese government as millions of refugees had shown up at their door, making it very difficult to provide them with the needed services. They were simply overwhelmed and it meant the refugees suffered more. Many Syrian youth, including Douaa, were not allowed to go to school. 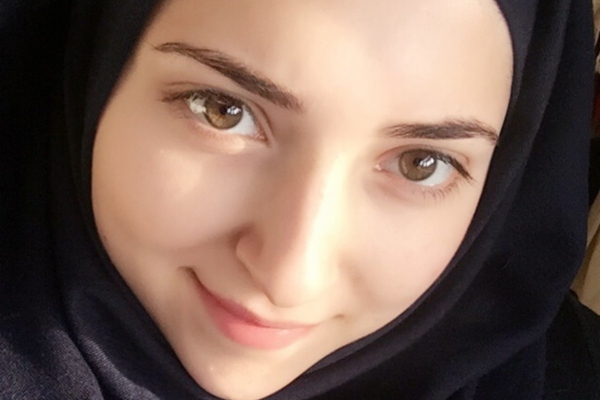 Even though she had started her first year of law school in Syria, Lebanese school officials denied her request to attend school in order to continue her studies. “All I wanted was to go to school. I always wanted to do law and help people,” says Douaa. Douaa, who was now 19, walked into a local supermarket one day after seeing a posting for a job. Douaa worked as a cashier and just several months later was promoted to supervisor but life was still difficult. She was in constant fear her brothers might be recruited into the Syrian army. She was in despair at not being able to go to university. It was hard for Douaa to accept a life with no future in Lebanon. Douaa approached the United Nations High Commissioner for Refugees (UNCHR). They were in Lebanon handing out ration cards and providing assistance to refugees. They also supplied refugees with money to buy food and other necessities. Although her family was not living in a refugee-sponsored house, she approached the UNHCR to ask for resettlement to a new country. Douaa had an advantage. When she was in high school, she had taught herself English by watching television shows in English. Her English was much better than that of most Syrians. It made it easier for her to apply to the resettlement program. Fortunately, the UNHCR responded quickly to her request. Within two months, she was given the great news that she could move to Canada. However, it was a mixed blessing. Initially, only Douaa was allowed to come to Canada because she was going to attend university. “I could not leave my family. I had to wait for them,” she says. Finally, the family got the news they had been waiting for anxiously. Resettlement happened quickly. Douaa and her family celebrated their first Christmas in Canada in 2016. However, she was unprepared for the “harsh” weather conditions in Ottawa. Her dream of going to school also had its challenges. In September 2017, Douaa applied to take the general arts and science at Algonquin for a year. She started her first year at Carleton last fall.